I need to attach files to work items that are larger than 4KB on TFS 2010. Use the web services on the Application Tier to increase the attachment size. The default value of work item attachments is 4KB. However, that limit can be adjusted up to 2GB if required. To update the value you must be a TFS Admin and on the TFS Application tier to perform this process. Open IIS Manager and expand <Server>\Sites\Team Foundation Server\tfs\_tfs_resources\WorkItemTracking\v1.0. If using Server 2008 switch to Content View to see the webservices. 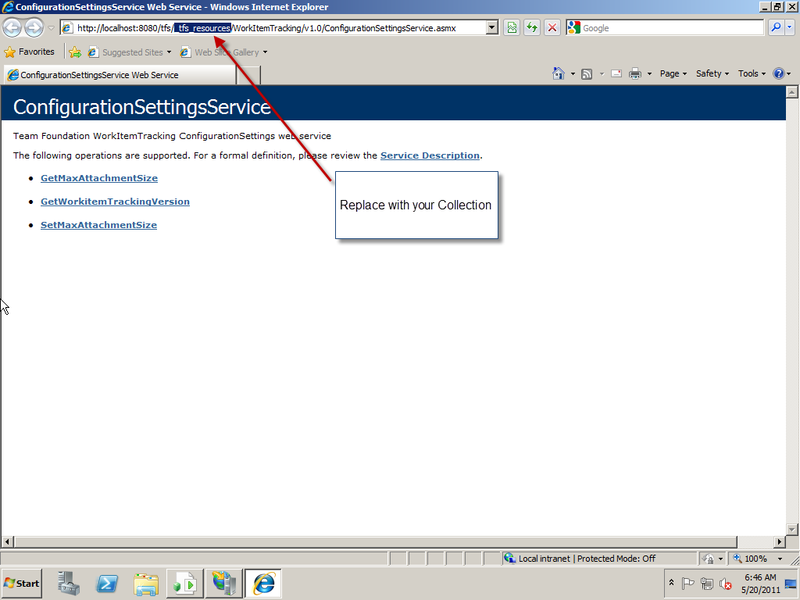 Right click on ConfigurationSettingsService.asmx and select Browse. The trick to making this work is to replace “_tfs_resources” with the collection name. After you replace “_tfs_resources” with your collection name press Enter to reload the page. Now you can use the SetMaxAttachmentSize method to increase the file size. How to increase the work item attachment size in TFS2010.